“Into the Wild”, the critically appraised film directed by Sean Penn and based on a book by Jon Krakauer, falls a little short by my standards. Maybe, my expectations were too high, but I was at the least mildly disappointed. It’s a sad state of affairs when all it takes to get the critics’ praise is to slow down the narrative to a crawl and a character that reads directly from a book and speaks in metaphors. It just seems too easy. In “Into the Wild”, Chris McCandless (Emile Hirsch) has just graduated from Emory University. At a graduation celebration dinner with his parents, Chris has an argument about his car. Chris has an old junker of a car and his parent want to buy him a brand new car. However, Chris doesn’t want it. Chris doesn’t want material things; he associates these material things and money with his parent’s detached relationship. Chris wanting to leave a society that treasures material things, decides to travel to Alaska to live in the wild, but before he sets off on his journey, he donates his life savings, burns the cash in his pocket and abandons his cars. Chris McCandless even takes up a new name, that of Alex Supertramp. On his way to Alaska, Chris meets quite a cast of characters that live free of careers, money and any sort of financial responsibility. These are people that are truly free and Chris finds this simply live sort of attractive. He manages to support himself by taking odds jobs. One of these odd jobs ends up being on a farm managed by Wayne Westerberg (Vince Vaughn), but Chris finds living on the money Wayne pays way to easy and prefers the adventures he had when he was penniless. Once in Alaska, Chris has his adventure, but wines up in some trouble when he is not able to cross the river out of the wilderness, because of the melting ice. In the end, Chris learns a big lesson that he scribes on his notebook and his parent finally understand how Chris feels specially his father Walt McCandless(William Hurt). “In the Wild”, has a superb cast and Emile Hirsch is pitch perfect. William Hurt who blends into his characters for just about any movie he does is textbook perfect and even Vince Vaughn who we are not use to seeing play these type of character does a great job. The main problem with the movie is the pacing. The movie takes a long time to get where it is going and while it is doing this it doesn’t seem to do much but stall. A whole thirty minutes could have been cut out from the movie without losing any of its essence. There are also a lot of arty shots that don’t seem to fit with the movie and just come out of the blue. Penn just throws then out thinking, oh these shots should increase the chance of getting an Oscar nominations. 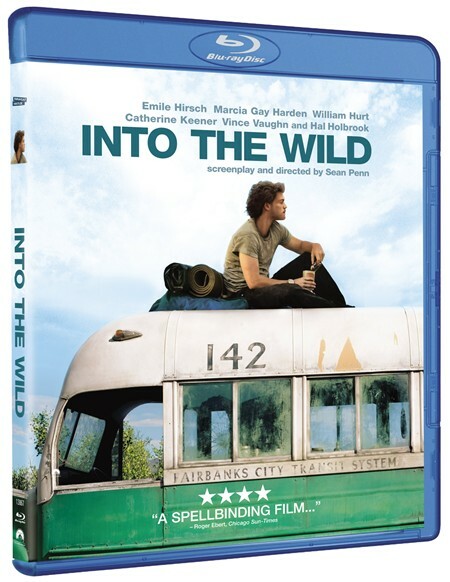 Paramount is releasing “Into the Wild” in Blu-ray and it looks stunning. I was blown way by the way Alaska looked on my 54” LCD TV. The colors are vivid and the landscape of all the different locations looks dazzling. The skin tones, the look of the sky and the river almost make you feel like you are there and the sound is just as good. The Dolby TrueHD audio is stunning and Eddie Veddar‘s, lead singer of Pearl Jam, vocals have never sounded better. Since Eddie Veddar wrote all of the songs directly for the movie, they all fit perfectly. AInto the Wild: The Story, The Characters. A behind-the-scenes look at film with: Sean Penn discussing how he became interested in the book and Jon Krakauer discussing how he discovered the story. (21:54).